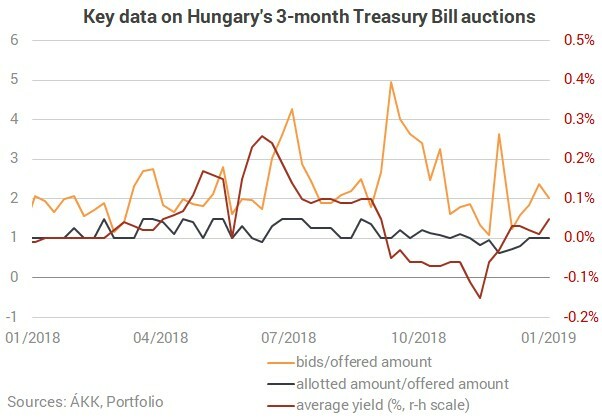 Hungary’s Government Debt Management Agency (ÁKK) allotted 30 billion forints worth of 3-month discount Treasury Bills at its weekly auction on Thursday, as planned, while the average yield has risen to a level not seen since October 2018. The ÁKK has received HUF 60.4 bn worth of bids from primary dealers on a HUF 30 bn lot of 3-m T-bills at its weekly auction on Tuesday, but despite the heavy demand it allotted no more of the instrument than planned. The average yield was set to 0.05%, which is the highest since October 2018, and 4 basis points higher than a week ago.